Engineering Consulting Services (ECS) is pleased to announce the acquisition of River Valley Testing Corp. (RVT) whose offices will now become the Central Wisconsin Offices of ECS Midwest, LLC and a member of the ECS Group of Companies. Founded in 1988, ECS is a leader in geotechnical engineering, environmental consulting, construction materials testing, and facilities engineering for a wide array of projects and clients with over 50 offices in the United States. 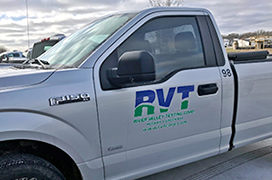 RVT specializes in geotechnical engineering; construction materials testing; and environmental engineering; RVT has offices in Green Bay and Neenah, Wisconsin. “The resources of ECS will provide a diverse range of services to our clients. As we evaluated possible firms that could help take us to the next level, ECS was hands down the best cultural and professional fit. Like RVT, they’ve grown their business by understanding that your clients, both internally and externally, come first. This is a tremendous opportunity for RVT to expand geographically and for our employees to grow technically and professionally. We are very pleased to join forces with ECS,” said Alex Barker, P.E., President of RVT. RVT was established in 1990. Under the Senior Leadership of Mr. Alex Barker, P.E., President and Mr. George Barker, P.E., Vice President, employees of RVT will continue to provide integrated engineering services and technical support for RVT clients throughout the development process with their established team. RVT will continue to use their drill rigs to deliver both the equipment and the highly-trained personnel needed to complete any given project. With ECS’ focus on developing client relationships and ability to offer our services in new locations, this was the perfect time and opportunity for RVT to join ECS. “We look forward to expanding our unparalleled service and commitment to our clients throughout the Midwest and providing opportunities for the RVT employees to grow within the region and with the rest of the ECS Group of Companies”, Brett Gitskin, P.E., President, ECS Midwest, LLC. The acquisition of RVT by ECS became effective on December 15, 2017. RVT will operate as part of ECS Midwest, LLC and a member of the ECS Group of Companies.